Home / Blog / Web Development / HTML 5 has cool stuff: new input types! HTML 5 has cool stuff: new input types! Even though many elements of HTML (HyperText Markup Language) 5 have only limited application at this time due to lacking browser support, there’s little reason not to make use of them. The design of the markup language is intended to minimize dependence on user agents, failing invisibly if the browser doesn’t offer that feature, which helps encourage early use of new elements. Of course, the lack of support does have some consequences. We can’t just go out writing HTML 5 without having significant awareness of this lack of native support — we have to compensate. Nonetheless, being able to incorporate great new elements like figure, progress, meter, nav to improve semantics or browser capabilities including content prefetching to provide a faster, more seamless experience for users is actually pretty exciting. But new input types…cold shivers. Sadly, they’re also one of the less useful elements at the moment. Until support is available in browsers, they’ll simply fall back to a text field, unless supplemented by scripting to customize their behavior. But hey — easy upgrade, right? Now, this all depends on several factors: vendor implementations need to meet user agent accessibility guidelines; interfaces between browsers need to be consistent; and, of course, the attribute values need to be implemented by enough browsers to make their use truly valuable! Today , support is pretty limited. You can take a look at Roger Johansson’s HTML 5 input type test page and see whether your current browser supports any of them. If you’re using recent versions of Opera or Safari, the answer will be yes — otherwise, you won’t be seeing very much of interest for a while. But you can implement these input types today. All of these different input types fallback to a simple text input. If you’re using the HTML 5 doctype, there’s nothing stopping you from applying HTML 5 input types right now. Any browser that doesn’t support them will simply provide a field to enter plain text — so if you’re currently collecting email addresses in a text input (which seems pretty likely,) then you have no excuse not to change now. You may not see the benefits right away, but why wait? You’re not going to see any downsides, either. Even when browser support for HTML 5 input types is fully available, it’s entirely possible that you’ll want to take the route to custom develop interfaces for various fields. However, unlike the past, you’ll only be needing to do this because something particularly unique is required for the project; for lower-budget projects, you can save a lot of labor and provide a solid interface just by using native features. Now we only have to wait until Explorer (hate it) catches up in their coding to undexrstand HTML (HyperText Markup Language) 5. Maybe by 2020 if we a lucky. The new input types aren’t going to get the same publicity as the open video support because, to be blunt, we don’t rely on Flash for data input in web forms (apart from one nifty implementation of file uploads I saw, which supports client-side filesize validation, which can be a godsend when dealing with large file uploads). 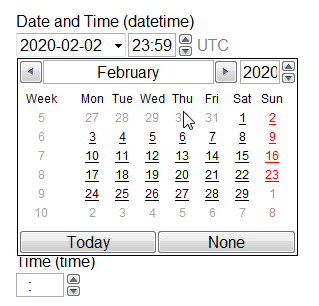 People may keep using basic text input for dates even after the wholesale acceptance of HTML5, because form fields have traditionally been a nightmare to style cross-browser. I really need to get up to date on HTML (HyperText Markup Language) 5 i havent even really looked at it… and i had only heard about the ‘video’ feature as you said! I have a few sites i’ll definately be adding the new INPUTs on as they require dates and they get stuffed up all the time… hopefully this will help! thanks for sharing such feature with us. I think the HTML (HyperText Markup Language) 5 features like figure, progress, meter, nav, content prefetching etc are innovative and helpful. I agree I think that’s one of the coolest features!